Astronomers at NASA have just discovered with they are calling a ‘Behemoth Black Hole,’ and it sounds both awesome and completely terrifying. The supermassive black hole was found by NASA’s Hubble Space Telescope and the Gemini Telescope in Hawaii, and is one of the biggest ever discovered, “weighing 17 billion suns” (which, is evidently, a NASA standard of measurement now). 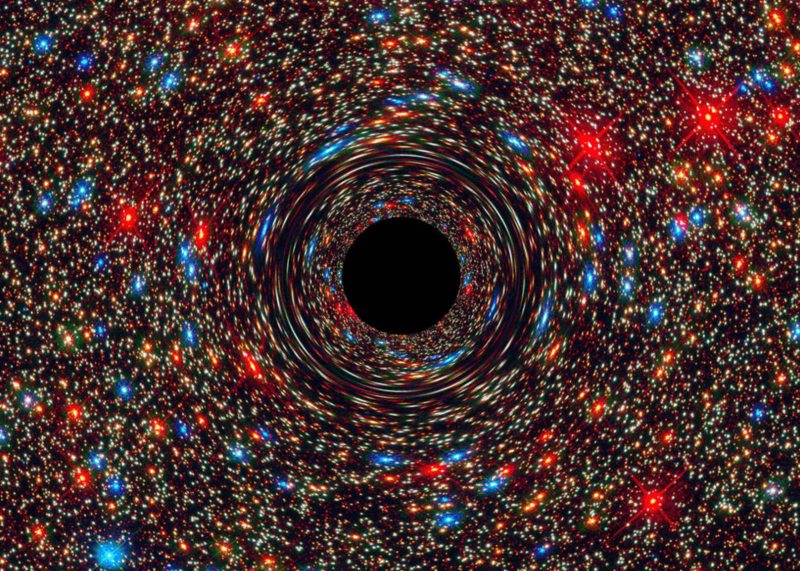 So what does a supermassive black hole look like? This computer-simulated image should give you an idea. As the lead discoverer explained, “The newly discovered supersized black hole resides in the center of a massive elliptical galaxy, NGC 1600, located in a cosmic backwater, a small grouping of 20 or so galaxies … To become this massive, the black hole would have had a very voracious phase during which it devoured lots of gas.” Black holes are still somewhat of a cosmic mystery, as the fabric of spacetime breaks down as it gets sucked in. Don’t worry though. Planet earth isn’t in any danger of being swallowed up by the behemoth: It’s 200 million light years from our solar system.